Most people know how desserts complete my meals (and sometimes me) so hereâ€™s a list of dessert places that I really like in Singapore! ðŸ¤— They are in no particular order because I have different cravings from time to time. I really love Sunday Folkâ€™s waffles and ice cream ($10.70). Especially the pistachio flavoured soft serve. Plus their waffles are crispy on the outside (most of the time) so that makes me happy too! I love lava cookies and this place has really good lava cookies with ice cream ($8.90)! This cafe is originally from Bangkok and they have a variety of ice cream flavours that rotate quite often too! I've only been here 3 times but I was remembered on my third when I was greeted with "Welcome Back", awww that's so nice! Hojicha pancake ($17)! This is only available on their brunch menu and itâ€™s pretty good! It should be shared though, itâ€™s quite rich in terms of taste. I expected lava (not sure why) though but there wasnâ€™t any. Can kueh be a dessert? Hahah. I especially love their putu ayu but itâ€™s so evasive that you can only get them at lunchtime or at 5pm and it gets sold out really quickly when itâ€™s released! Their ondeh ondeh is really good too, they burst in your mouth the moment you bite into them! I really love tangyuan and I find it difficult to find good ones in Singapore! This isnâ€™t the traditional black sesame/peanut types but the gula melaka was a nice surprise! I really like their ang ku kueh because it has a lot of filling and many flavours such as Peanut, Sweet Bean, Salty Bean, Corn, Coconut and Yam. Even though I still like the traditional peanut flavour most, the other flavours taste pretty good too! They have 3 fixed flavours and 1-2 seasonal flavours but my favourite is the Earl Grey which is a permanent flavour now yay! Their permanent flavours are vanilla, matcha, black sesame and earl grey. You can check out their Instagram page @shuuchoux to find out about their seasonal flavours! December's seasonal flavour is Hojicha and it's really rich in flavour too! Being a fan of hojicha, I enjoyed it a lot. Atlas Coffeehouse has really good pancakes which are slightly crispy on the outside and yet moist and fluffy inside. 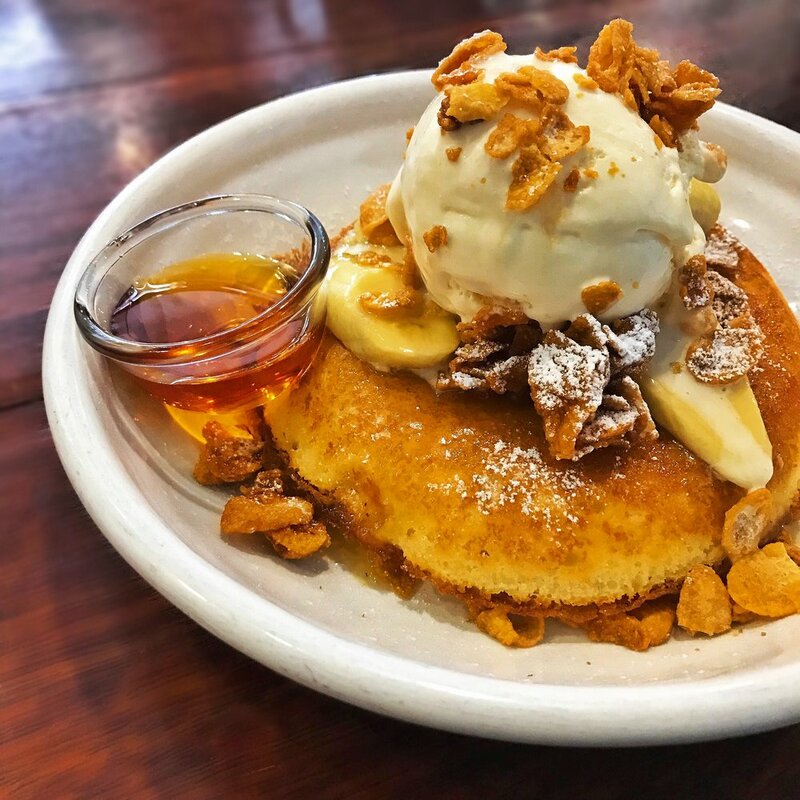 This is the Butterscotch Banana Pancake and the caramelised cornflakes add an extra crunch to the dessert too! Etto (used to be called Blackbird Bistro) isn't a well-known cafe yet and what many people do not know is that they have really good desserts! The picture above is an ondeh-ondeh lava cake ($14) which was really fragrant and we enjoyed the coconut and gula melaka a lot! The Earl Grey lava cake ($12) is also worth trying especially if you're a fan of Earl Grey tea! The Earl Grey fragrance was very prominent the moment we cut open the cake and the taste was rich too! When the Chocolate Dome ($12) was served, I wasn't expecting much because I've eaten (and were disappointed with) many similar cakes. This had surprised me because the chocolate mousse was dense and rich plus there was a good amount of the crispy filling in the cake too. We had really enjoyed this and this is one of the few good chocolate cakes that I know of. When you know that there's always room for dessert and are looking for places to have some, you can try out the places in this list. As the saying goes, dessert doesn't go to the stomach but it goes to the heart. Happy eating!